Work commenced in August 2012 on a project aimed at securing and consolidating the archives compiled by Nottingham City Museums staff during the excavation of sites lying principally within Nottinghamâs pre-Conquest Borough (Young, C.S.B. 1982 and 1986; Young, G. 1987). This work will provide the foundation for a synthesis of the evidence for the development of the early Borough and will assess the potential of the archive as a resource for future research into the origins and growth of Nottingham. Excavations were conducted between 1969 and 1980 at five sites inside the pre-Conquest Borough, at Drury Hill, Woolpack Lane, Fisher Gate, Boots Garage and Halifax Place, and just beyond its perimeter at Goose Gate. These were carefully positioned with the aims of locating and characterising the Borough defences and of investigating areas of the interior with potential for the preservation of significant archaeological remains. The archive derived from these excavations represents a major untapped resource for study of the early development of Nottingham, which since its rise to prominence as one of the Five Boroughs of the Danelaw has played a key role in the history of England..
Excavations commenced in 1969 at Drury Hill, on a site straddling the south-western defences of the pre-Conquest Borough. Fieldwork in 1969 and 1970 uncovered traces of a rampart and a massive flanking ditch running along the eastern edge of Drury Hill. The ditch cut a sunken-floored building attributed to the period from c.650â850, providing clear evidence of settlement along the cliff edge prior to construction of the defences; it preserved evidence of a major recut dated to the tenth century, but the date of its construction, whether before or during the Danish occupation, remains unclear. This recut, which is replicated in the defensive ditch uncovered at Woolpack Lane, was employed as evidence for two main phases of construction. In the immediate Post-Conquest period, the rampart was levelled and the ditch was filled and then built over. Excavations revealed ditch deposits beneath a late eleventh century square, timber-built, two-room cottage, which in the early twelfth century was replaced by a timber aisled hall. Property boundaries were re-aligned along new frontages around 1150, following destruction by fire of the aisled hall, and in the 1690s a courtyard arrangement was established that persisted with some modifications until wholesale demolition in the late 1960s prior to construction of the Broadmarsh Shopping Centre. Excavations in 1970 at Woolpack Lane uncovered another length of the pre-Conquest Boroughâs defensive ditch and traces of the levelled rampart, both running from west to east along the northern edge of Woolpack Lane. The ditch preserved evidence of a major recut, which as at Drury Hill was attributed by the excavator to Period 3. The fully silted Period 3 ditch was cut in the first half of the twelfth century by another substantial ditch, separated from an internal bank by a wide berm. This later ditch, which was assigned to Period 4, was interpreted as part of the medieval defences that had enclosed both the pre-Conquest and Norman Boroughs; from the evidence of ditch recuts, it was shown to have continued both northwards and eastwards of the Woolpack Lane excavation trench. Its course could be traced for only a short length, but the defences represented by this twelfth century feature may have continued north-west along the eastern edge of Cranbrook Street and south-east along the line of the pre-Conquest defences. Intermittent excavations between 1971 and 1978 to the north of Fisher Gate, across an area extending from Bellar Gate to Carter Gate, revealed a wide and fairly shallow west-east ditch. It was suggested by the excavator that this might mark the southern defences of an early Anglian settlement extending eastwards of the pre-Conquest Borough, but the date and purpose of this feature remain uncertain. The area south of this ditch seems to have been unoccupied until the construction in the late ninth or tenth century of a timber building interpreted by the excavator as a bow-sided hall reminiscent of structures recorded at Halifax Place (below). Yet later developments include the construction around 1100 of a cobbled road joining Bellar Gate and Carter Gate. The road frontages were flanked by barn-like timber houses fronting land plots preserving pits, ovens and kilns. One of the more important discoveries was a rock-cut corn-drying kiln, dating from c.1200, which had burnt down while in use (Young 1982). The kiln pit was connected to a stoke-hole approached by rock-cut steps, and was edged by stake-holes preserving the charred remains of a wattlework frame of hazel that had survived partially in situ. This frame had been lined internally with clay, and was separated from the pit wall by a thin layer of sand packing. Grain had been dried on the floor of an above-ground compartment, which was reconstructed as a domed wattlework construction sealed externally by clay. The kiln yielded an abundance of carbonised emmer wheat, including complete ears on stalks, wood and daub generated during the fire, and remains unique in Nottingham in terms of the richness of its material remains and the level of structural preservation. Clearance around 1300 retained the cobbled road joining Bellar Gate and Carter Gate, but discovery of a range of new buildings suggests amalgamation into one property; these new buildings included a timber building with service wing, warehouses or workshops and a courtyard. The area was derelict from c.1350 until the sixteenth century, which saw the construction of a substantial boundary wall that was later cut by a probable Civil War ditch. In the nineteenth century, as Nottingham developed its industrial base, the area became a focus for tightly packed workersâ housing. Excavations in 1972 at Boots Garage, between Woolpack Lane and Barker Gate, revealed a wide and fairly shallow east-west ditch, which was interpreted as possibly the northern boundary of the Period 1 settlement postulated between the River Beck and the sandstone outcrop occupied by the pre-Conquest Borough. Parallels were drawn by the excavator with the east-west ditch identified at Fisher Gate, but as on that site doubts remain regarding the purpose and date of this feature. The Barker Gate frontage was greatly disturbed by post medieval and modern building foundations and cellars, but traces survived of occupation dating back to around 900. Along Woolpack Lane, a slight wattle and daub structure of ninth or tenth century date was recorded. This was replaced by successive timber buildings, followed by clearance in the thirteenth century for a malt kiln and associated cellar. These structures were overlain by buildings of the twelfth and thirteenth centuries, including one with a cellar dated to c.1290 that was identified in deeds. Evidence of industrial activity in the period spanning the Norman Conquest was found in the form of a corn-drying kiln and smelting hearth, while later activity was indicated by a large bowlshaped kiln or oven dating to the thirteenth century. These backlands appear to have been abandoned by c.1350. From 1978 to 1980, excavations in the heart of the pre-Conquest Borough at Halifax Place revealed evidence of early activity in the form of a linear boundary ditch dated to between 650 and 850 and a remarkable group of large, timber buildings of at least three phases predating 1000 (Young 1987). Clearance of these structures in the eleventh century was followed by the construction of new buildings and of a pottery kiln dating to c.1000. Other evidence for industry attributable to the period from c.1030â1070 was provided by several timber-lined pits that may have been used for tanning. The site was reorganised around 1100, with properties along at least two frontages and intense activity until c.1350, including eight corn-drying kilns, pits and an oven or kiln. A third frontage was occupied by buildings in the thirteenth century, preceding a phase of dereliction, rebuilding in the seventeenth and eighteenth centuries and, in the nineteenth century, industrialisation associated with lace manufacture. Nine caves were also encountered on the site, including at least three that may date from the High Medieval period. 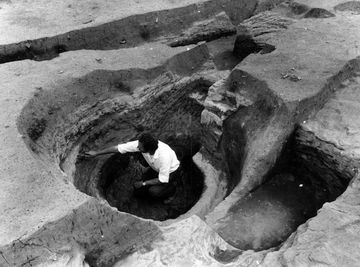 Excavations at Goose Gate in 1976 and 1977, immediately outside the northern defences of the pre-Conquest Borough, revealed buildings spanning the period from c.1100 to c.1350. Pits, ovens and corn-driers were recorded behind the buildings, together with two pottery kilns producing Nottingham Splashed Ware. These were replaced by more pits and by two cellar buildings, probably used as warehouses or workshops. One of these buildings appears to have been abandoned by c.1350, but the other cellar was used until the sixteenth century, when it was associated with workers in animal horn. A fifteenth century maltkiln, sixteenth century caves and a seventeenth century latrine in a timber shed were also recorded. The site seems to have been abandoned by the end of the seventeenth century, and is shown on a map published in 1744 by John Badder and Thomas Peat as the location of an orchard, but the area was redeveloped during the industrialisation of the Lace Market in the nineteenth century. Mastoris, S. and Groves, S. (eds) 1997. Sherwood Forest in 1609: a Crown survey by Richard Bankes. Thoroton Society of Nottinghamshire Record Series 40. Nottingham Urban Archaeological Database. Nottingham City Museums and Galleries. Young, C.S.B. 1982. Discovering Rescue Archaeology in Nottingham. Nottingham: Nottingham City Museums. Young, C.S.B. 1986. 'â'Archaeology in Nottingham: the pre- Conquest Borough'â' in S.N. Mastoris (ed.) History in the Making: Recent Historical research in Nottingham and Nottinghamshire 1985, 1â4. Nottingham. Young, G. 1987. 'â'Archaeology in Nottingham: the Halifax Place excavation'â', in S.N. Mastoris (ed.) History in the Making: Recent Historical research in Nottingham and Nottinghamshire 1986, 1â6. Nottingham 1987.